Hello there and happy Easter to you! 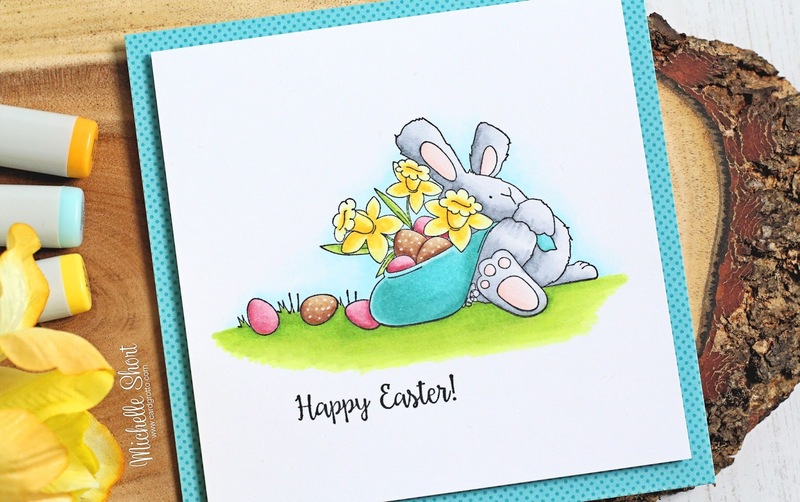 Today I have a card to share using the adorable Hoppy Easter Bunny Wobble stamp from Stamping Bella. I thought the image would be really cute for an Easter card to my mum. I started off by stamping the image on to a piece of white cardstock, using Memento Tuxedo Black Ink. The individual egg and grass are separate stamps, so I masked these off as I went to create a little trail of eggs. 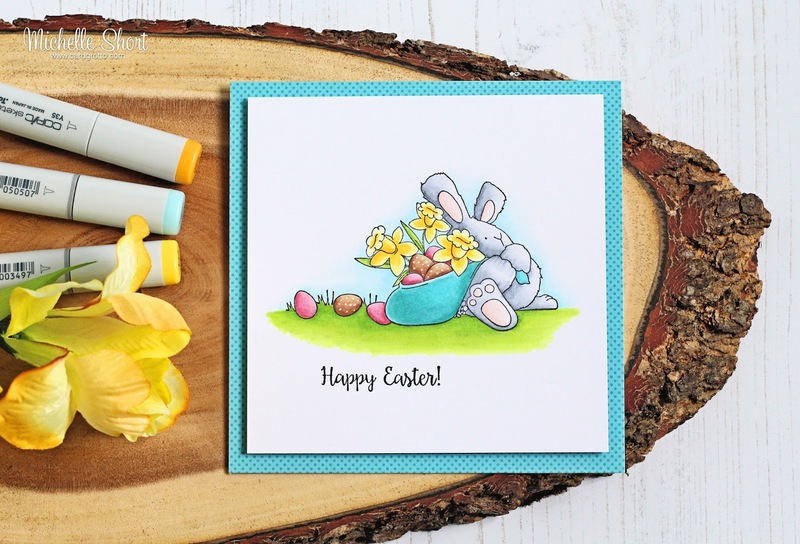 The sentiment in the set reads 'hoppy Easter' which is cute but I wanted a 'happy' one so I took the sentiment from the Easter Bunny Chick set instead. The image was coloured using Copic Markers. I then added clear Wink of Stella to the eggs and then for the chocolate ones, I added on white dots with a gel pen. I took a white 5.25" square card base and added a piece of Doodlebug patterned Paper on to the front panel. The image piece was then added on top with foam sheet. COPIC MARKERS - Bunny: C5, C3, C1, C0, R00, R000. Daffodils: Y35, Y18, Y13, Y11. YG17, YG23, YG03. Bag: BG57, BG53. Easter Eggs: R85, R83, R81. E25, E23, E51. Grass: YG17, YG23, YG03, YG01. Sky: B00, B000, B0000, 0. I am sure I have said this many times but I love Stamping Bella images! They are so lovey to colour! Thanks so much for popping by today. I hope you enjoy the rest of the Easter weekend. This is such a cute card Michelle and so beautifully coloured. Just adorable, Michelle, and your coloring is gorgeous! Adorable....love your sweet bunny, he looks beat after carrying that load of Easter Eggs.